Game of Thrones season 5 was a terrible season for the prominent characters as many were killed off and many other were in serious trouble. However fans are still doubtful about some characters like Jon Snow and Stannis Baratheon who weren't shown dead on camera. Jon Snow was stabbed multiple times and his lifeless body was lying on the ground when the season ended. Now the show creators and Kit Harington have stated that Jon Snow is dead but you can't just simply kill a character like Jon Snow and now that Kit Harington has been spotted in Belfast, there is hope that he might be alive. Same is the case with Stannis Baratheon. In the season finale, Brienne finally tracked down Stannis and swung her sword at him, which implied that she killed him and even the show director has said that Stannis was dead but as you know, in Game of Thrones unless you see a dead body, you can't be sure whether the character is still dead or there are chances of survival and now George R.R. Martin himself has given information about his fate. Recently on LiveJournal, George R.R. Martin answered a fan's question by saying that Stannis Baratheon is still alive...in his books! Now here comes the tricky part. GRRM has specified that he is still alive in the books. So that means its possible that he might be dead in the series. 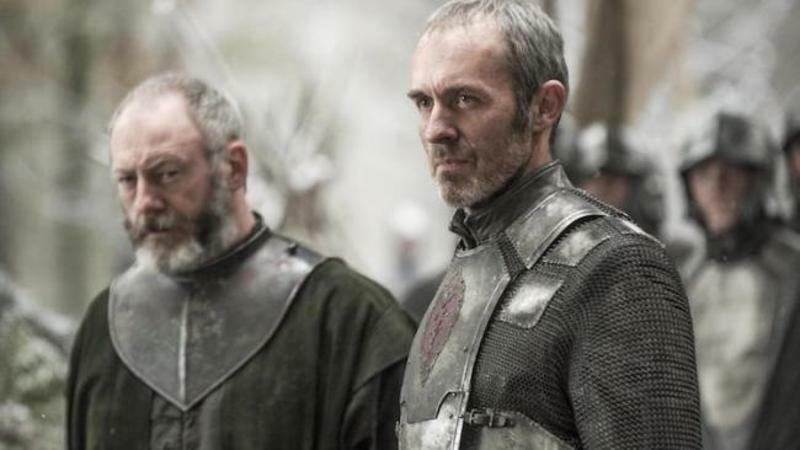 There have been many cases where characters who are still alive in the books have been killed in the TV series or it might be possible that Stannis somehow survives and is still alive.